I'm pleased to announce that I will be conducting 2 workshops on October 19th and 20th this year at the 2019 CMW (Cotswold Miniatures Workshops) in Peterborough, Cambridgeshire, England. Places are limited so please visit https://www.cmwminiaturesworkshops.co.uk to view the available courses and book online. On Saturday you will learn how to make 9 jars of lollipops for your miniature sweet shop and on Sunday you can learn how to make signature Littlest Sweet Shop Gingerbread House just in time for Christmas! Both courses are in traditional 1:12 miniature scale. On Sunday you will learn how to make 1:12 scale Gingerbread Houses which is the perfect centrepiece for your Christmas miniature scene. 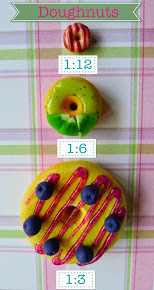 The cookie base measures 3cm in diameter and everything is included for you to decorate your own magical piece. I will be supplying lots of miniature candy, chocolate, cookies and biscuits for you to create your dream house. I will even make pole candy in your choice of colours on Saturday. Just let me know what is your colour theme when you book the class. Snowflake and chocolate window at the back. On Saturday you will learn how to make our famous lollipops in 9 different colour combinations! I will even demonstrate how to make simple sweets to fill up the jars so you can also open your own miniature sweet shop at home. There will be demonstrations on making pole candy, bonbons, gumballs, chocolate balls, and marshmallow. This annual event will be a great retreat for dollshouse and miniatures enthusiasts from all over the country. There is no other event like it in the UK so if you always wanted to try to make your own miniatures - this is your chance! You will also meet other miniature fans and making new friends. I hope to see you there. تغيير موقع غرفة النوم: يُعدّ تغيير موقع غرفة النوم شيئاً ضرورياً، خاصةً إذا كان موقعها في الطابق السفلي، فعادةً ما تكون نسبة الرطوبة عاليةً في الطابق السفلي مقارنةً مع الطوابق الأخرى.